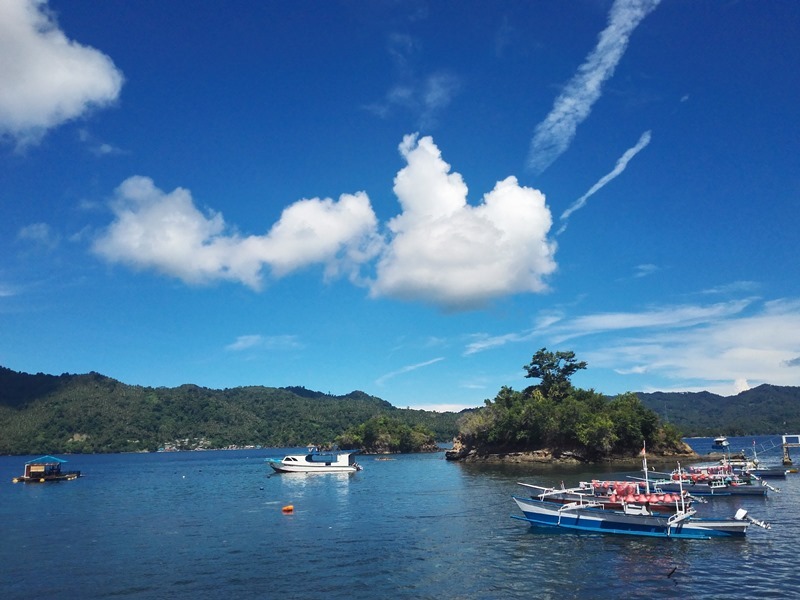 In May this year, we finally made our way to Lembeh and spent some time at Yos Dive Lembeh Eco Beach Resort and speaking to Pak Yos. Pak Yos is a soft spoken person and ever so polite. But you could tell he has a deep passion for diving and and a strong advocate for preserving the environment. 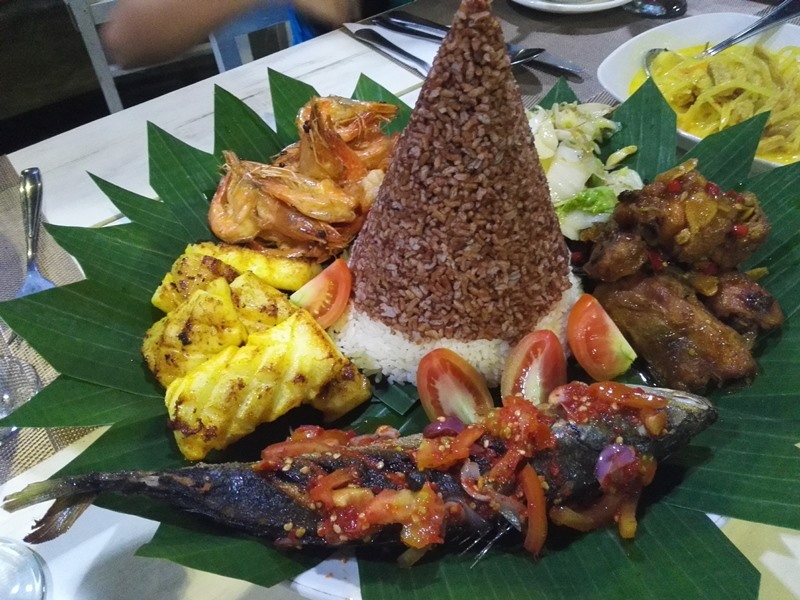 Pak Yos hails from the island of Bali. 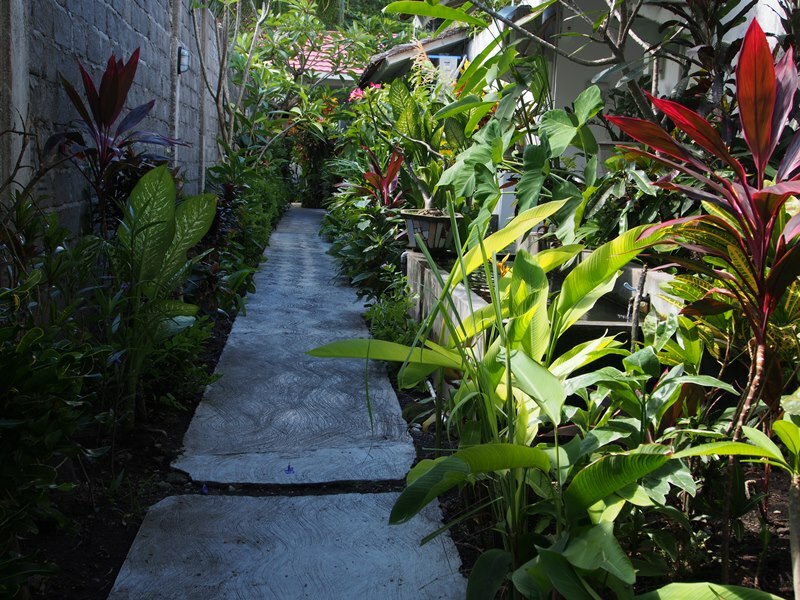 He recounts his early childhood memories of spending the weekends with his family by the beautiful beaches around Bali. And it is these experiences that gave him a sense of deep connection to the sea. He is no stranger to the service industry either. While still in school as a young boy, he would take up part time work as a waiter, receptionist and any work that would expose him to the industry. He says that serving people and making people feel happy gave him a sense of accomplishment and satisfaction. Of course, this is to the disapproval of his parents who wants him to concentrate on his studies first. Being in a rebelious stage of a teenager (just like what all of us went through), he perservered, much to his parents’ dismay and the occasional silent treatments. Children playing in the late afternoon. Fast forward a few years, he completed his architectural degree from a prestigious university in Germany. He then spent the next 14 years working in Germany to build his career and gain experience. It is his experiences in Germany as a professional that instilled a sense of social responsibility to the community as an architect. The lure of the seas however, never cease to beckon. So Pak Yos finally returned to his hometown in Bali where he continued to work as an architect, and at the same time, set up and ran his dive centre near Nusa Dua so he can spend more time near the sea and diving as well. 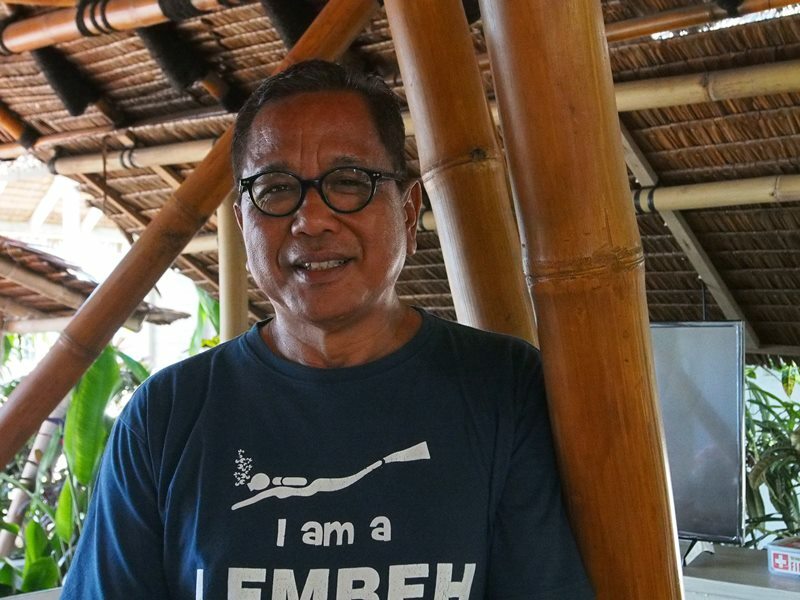 Work brought him to Manado, and for the next 18 years, Pak Yos has been involved with some of the most architecturally beautiful dive resort designs in the area and even in Ambon, Maluku. While living in Manado, he also set up a dive centre so that he could continue his passion of diving and underwater photography. Yos Dive Lembeh Eco Beach Resort, next to the black volcanic sand beach. About five years ago, he found the perfect location in Makawidey village to build his resort. Makawidey village itself is not too far away from Bitung, the second largest city in North Sulawesi after Manado. On the site stood an old but large house. Pak Yos wanted to preserve the building to keep its character and uniqueness in the area, but at the same time, wanted the place to be diver and underwater photographer friendly. 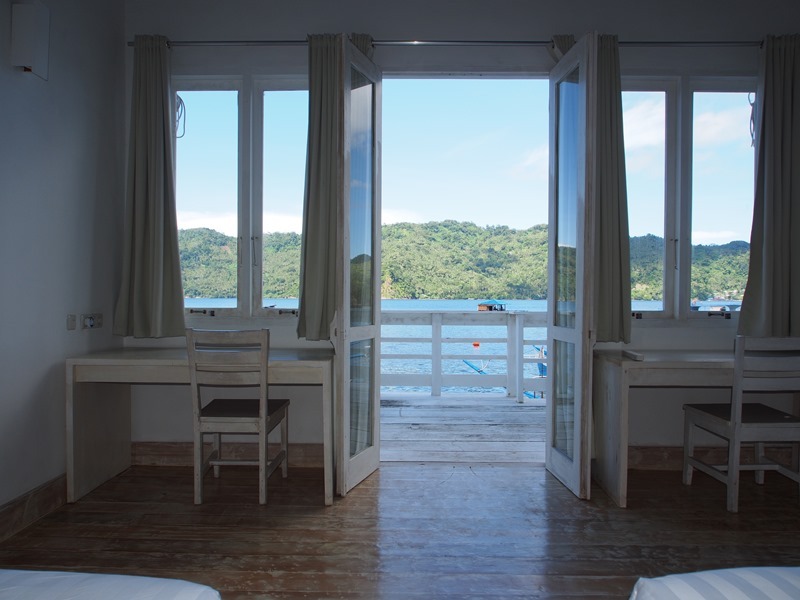 With minimal impact to the surrounding environment and with using eco-friendly building materials, he designed, refurbished and extended the building into what is now Yos Dive Lembeh Eco Beach Resort. The resort has beautiful rustic painted wood, lots of open spaces, spacious rooms and shower areas. (We ourselves are big fans of large shower areas.) 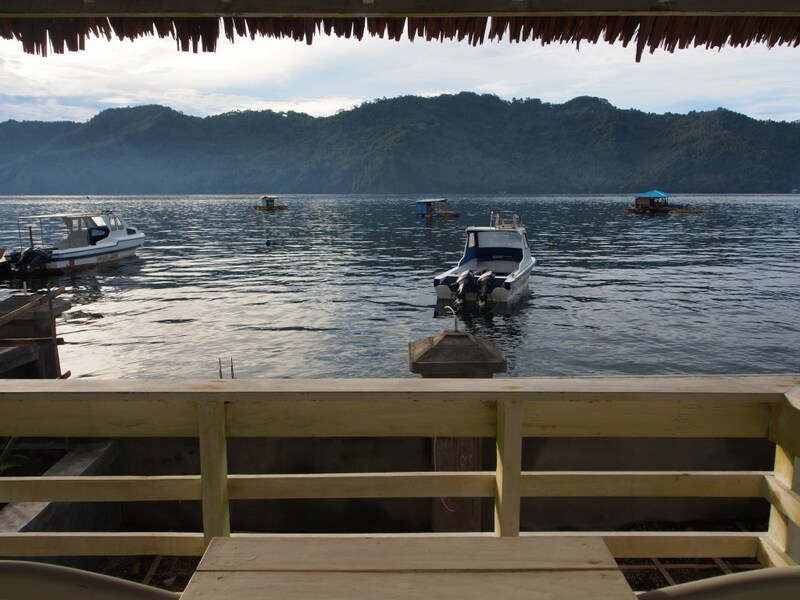 The resort itself is along the strait and faces Lembeh Island. After spending almost a week at the resort, we observe that Pak Yos is very hands on with running the resort, and with his right-hand person Fitri and his team, keeps the resort running efficiently. He often goes to the market himself to buy groceries for the resort kitchen too! 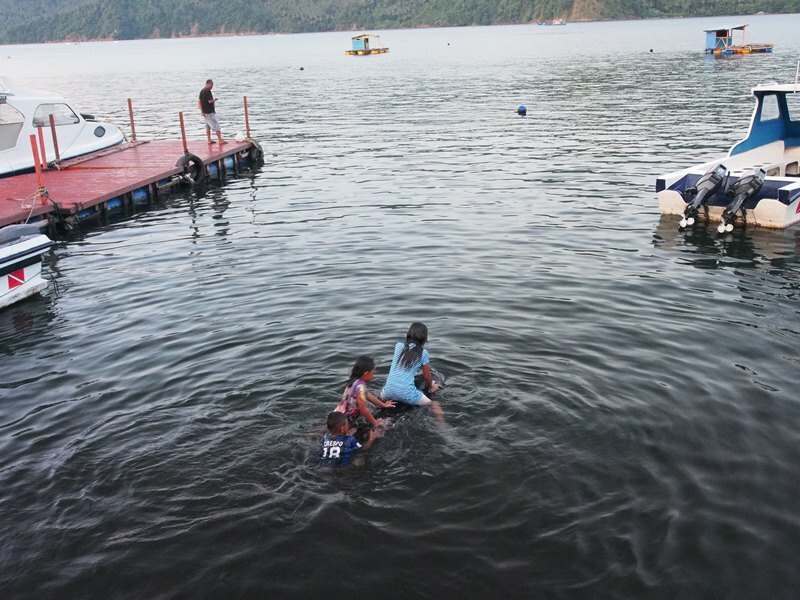 It’s easy to notice that Pak Yos subscibes to the true meaning of eco-tourism. He is sensitive to the local culture, making sure whatever the resort does, is respectful of the culture. The resort itself employs many locals. 90% of the resort staff and crew are really neighbours in Makawidey village. Whenever time permits, you will see Pak Yos underwater taking pictures of his favourite little subjects. He is very keen on snoot photography and frequently posts his portraits online. I’d encourage you to follow him and check out his amazing pictures on Instagram. Here are a couple of his portraits. These days, he no longer does full time architectural work, but will still help with designs for friends. After all, he needs more time to feed his appetite for diving and snoot photography while running a dive resort. 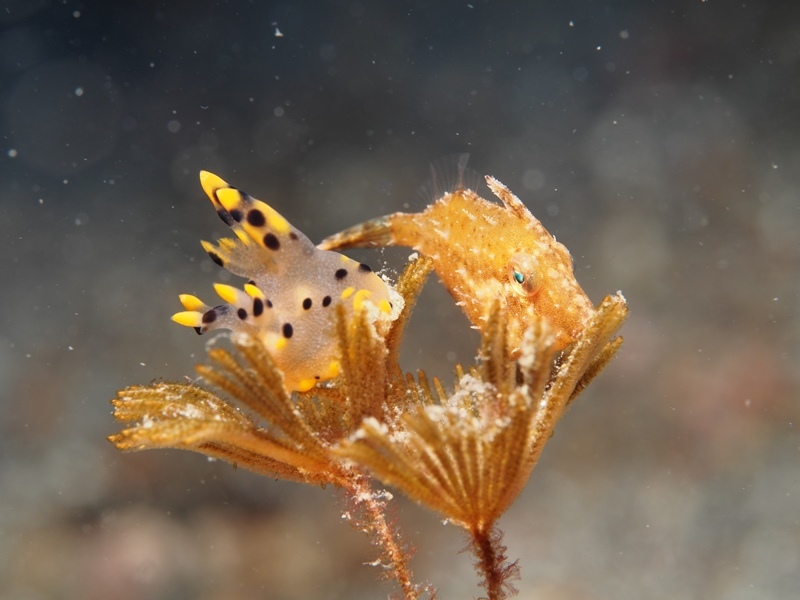 There are over 25 dive sites along the Lembeh Strait and this area is considered the capital of the world for macro life. The variety and species of macro life here is amazing, from the barely visible camouflaged to the brightly coloured “you can’t ignore me” variety. With the mild currents and usually slow moving subjects, it’s a great place fo new underwater photographers to come and hone their photography skills. Even for seasoned underwater photographers, taking photos of macro life can be just as challenging, trying to capture just the right moment. Here are some pictures we took while we were there. Some macro life you would likely encounter in the Strait. Thecacera sp “Pikachu” next to a file fish. 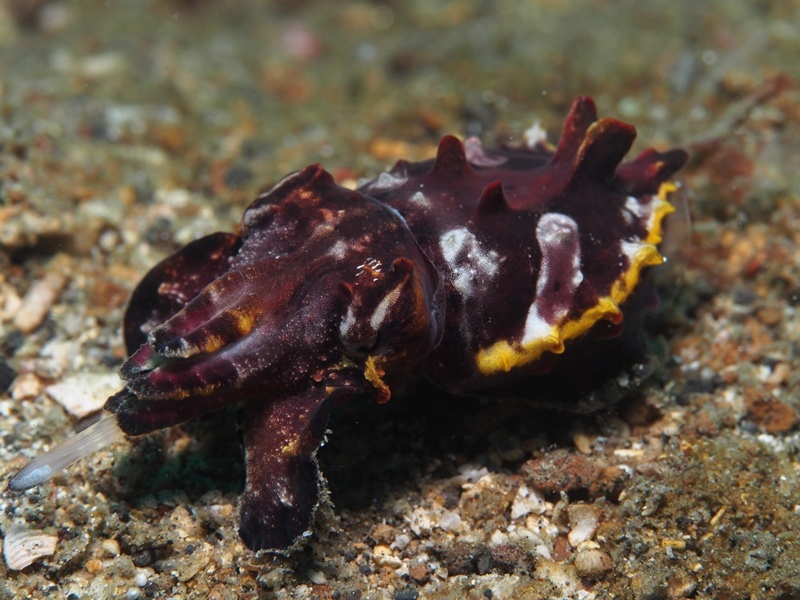 Flamboyant cuttlefish (Metasepia pfefferi). This cuttlefish species are great hunters on the ground but not so great at their buoyancy skills. Very delicious! 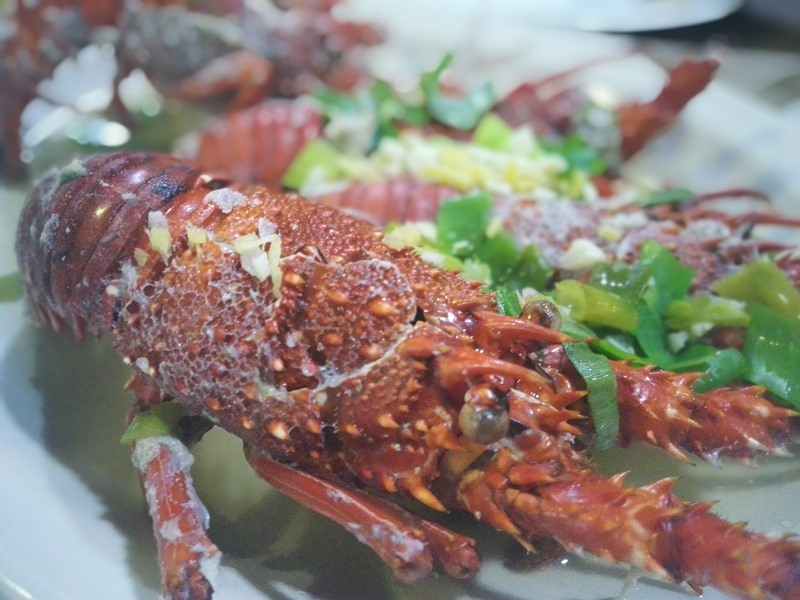 Dinners are cooked only when you are at the dining area, so food is served hot. On our last day at the resort, we had a treat to Nasi Tumpeng, a local special dish. Jake Mojiwat has been exploring the beautiful underwater world as a scuba diver since 1999. As a passionate diver, he is lucky to live within the Coral Triangle. With encouragement from friends he co-founded Asia Diving Vacation. In his free time out of the water, Jake loves exploring the outdoors and as a NAUI Instructor, teaches scuba diving at a friend's local dive centre. Grateful for the amazing supporters of this site, Jake continues to help new customers find their next amazing dive destination. "Inhale compressed air, exhale bubbles, see fishes, smile." Robert Lo’s Mabul Water Bungalows House Reef – Artificially Awesome! Asia Diving Vacation wants to introduce you to the best of what scuba diving has to offer diving in Asia. All writeup licensed under a Creative Commons Attribution-NonCommercial 4.0 International License. Some images copyright to their respective owners.